Cans of Daisy Cutter will be hard to come by next week due to a shortage of cans. NORTH CENTER — Planning on picking up a four-pack of Half Acre's Daisy Cutter beer? No can do. The North Center craft brewery posted on its blog on Thursday that Daisy Cutter cans were destroyed in a fire over the weekend at a supplier's warehouse. "As a result, we will have about a week with no Daisy cans being shipped to our distributors," the company said. Daisy Cutter still will be readily available on draft at neighborhood bars, including Half Acre's Tap Room, and for growler refills at the brewery, the brewery said. Responding to customer questions on Facebook, Half Acre said, "We had some stock of the other cans in house, so they hopefully won't be affected." The brewery's website notes that in 2010, Half Acre became the first Chicago brewer to can beer. 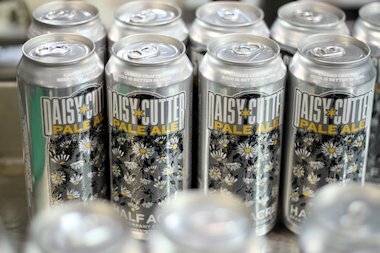 Daisy Cutter Pale Ale is one of Half Acre's few year-round brews.